Nevada 3-pc. Dining Set Sometimes the most precious things come in small packages, and this Nevada 3-piece dining set is no exception. Its casual design features a charming pedestal base, gorgeous 2-toned tabletop and leather-look seats. And for a little extra flexibility, the table's 2 drop leaves let you alternate between more floor space and table space in seconds. Sometimes the most precious things come in small packages, and this Nevada 3-piece dining set is no exception. Its casual design features a charming pedestal base, gorgeous 2-toned tabletop and leather-look seats. And for a little extra flexibility, the table's 2 drop leaves let you alternate between more floor space and table space in seconds. L: 40" x W: 40" x H: 30"
This dining room set was perfect for my small kitchen. I love how the sides fold down and it fits up against the wall. If I need to, I can seat 2, 3, or 4 people. The set comes with 2 chairs, but I recommend buying 2 extra chairs for a 3rd and 4th person. There is room on the table for 4 dinner plates, 4 glasses, 4 bowls, and a medium size serving dish. Great buy with quality construction and a smooth, non-gloss wood finish. Nice. Fits perfectly in my kitchen. 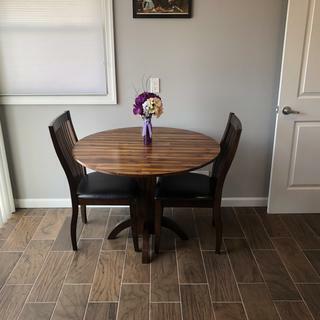 The set that I purchased is perfect The wood tones provide a very nice accent to the piece and it looks fantastic in my new dining area. Excellent quality and the chairs are very comfortable. We went to the store and picked this out. When it was delivered, it looked exactly the way we hoped it would. It seems very substantial and we are pleased with how it fits in our small apartment. The salesperson who helped us was friendly and knowledgable. Perfect for a limited space apartment. Very rich looking and is solid and sturdy. I love my table; I remember my mother having a table similar to this one. The flaps easily adjustable to make space in the dining area as well as easily adjustable to accommodate 3 or 4 people to the dinner table. I was in the store going to customer service to pay for 2 other items purchased and my husband spotted this dining set. We purchased it for our kitchen and needed something with a drop leaf. The chairs are comfortable and the whole set is very elegant looking. The set if very different looking. I love the two tone table top. Nice size and flexible too. The quality of this set is great. The table is perfect for a smaller kitchen area. The drop leafs on either side add the versatility needed for the best space utilization. I love this dinette set. It is the cutest small set I've ever seen. It's the perfect size for a single person or couple, in a small apartment. It is well-made. And it looks classy. Very good small dining set. Comfortable chairs. It will fit very nicely in a small space. I had a huge downsize and this is just perfect. A variety of colors and is just what I was looking for. Love it !!! blend with my other furniture. The Nevada dinning set that we purchased fits nicely into our small kitchen. Great value and well built. Comfortable, bright, fits nicely in my studio apt. We were searching for a nice-quality, small table to serve as an extra dining area in an open hall area and this was perfect. It's sturdy and we love the finish. Looks somewhat rustic and modern at the same time. I think the table/chair set is very nice. The chairs are comfortable and its the perfect size for where I wanted to put it. I am just a little nervous about the fold down wings of the table. I hope I am wrong, they just seem like the support beams that hold up the wings when the table is fully open, will not be sturdy enough when a heavy dish will be on it. So I try only to place heavy items on the main center of the table. Nothing has happened yet, I'm just a little nervous. But we got the protection plan, so if something goes wrong it can be fixed. Our sales person was extremely helpful and patient. He answered all questions, and even the questions we had once we got home were answered. He gave us him email and we emailed him from home. He quickly responded and was very helpful. I would definitely go back to him and have him help us with any future purchases. The dinette set was delivered assembled. I am very pleased that it fit into my one bedroom apartment as expected but was also pleased how the color of the wood fits with with the eclectic furniture already in the living/dining area. I'm especially glad I purchased a table with a center pedestal rather than four legs. It makes getting into and our of the chair much easier for me. I recommend it to someone looking for a good, sturdy dinette set. This is a great dining set for a small area. The folding leaves are easily dropped to create more room space and even to push against a wall. There's a little finesse needed to extend them but this provides plenty of dining room, you could definitely fit two more chairs around the table comfortably if you wanted. I like this Nevada Dining Set. It fits perfectly in my dining area with the additional two chairs I purchased. Just that when I finally was able to sit at table, I noticed two "dents" on tabletop. But no worries, placemats will cover. I did ask worker if I should check before signing but he said he checks when they go pick up to deliver and it was covered well so I took his word. No big deal, just had to let you know. The table that comes with the Nevada 3-piece Dining Set is convenient for my small apartment kitchen, with foldable flaps on the sides. The dark wood finish looks sleek, too. However, the table is *extremely* creaky with practically any pressure you place on any part of it while eating, which is rather annoying. Hi Jerry, we're sorry you are experiencing these issues. If you would please send your order and contact information to rfcare@raymourflanigan.com we'd love to see how we can help. I love it it’s a conversation piece ! Love this dining piece fits perfectly in my dining area ! This table is beautiful! Love the color of the table top. Fits perfect in my kitchen. Would recommend this table to anyone. Another great chose for my small space. Great size with drop leafs. Perfect size. Love the drop down and the finish. Was not looking for the “kitchen” table and found this nice looking dining table. Perfect for an apartment or a kitchen. I very satisfied with the Dining set and intend to explore your inventory for even more items. The Nevada 3-pc. Dining Set is perfect for a small kitchen and better looking in person than on line. The wood is very nice quality. With both sides folded down it holds 2 place settings comfortably as well as condiments used for that meal. The set was delivered timely and the delivery men put it together, showed me how the sides fold up and down, and removed trash. I highly recommend Raymor & Flanigan for service and quality. A great table and chairs for two for a small space. Great quality! Fits perfect and great quality! We would definitely recommend this table and chairs. The varied tones in the wood gives it a rustic look. And, the cushioned chairs are so comfortable. Love it! Love the design of the wood on this set. The chairs are very comfortable. Made very well and sturdy. We purchased 2 extra chairs so it is now a table for 4 when needed. Very happy with it. Picked up the boxes from the retail store. The three cardboard boxes fit into my car with the rear seats folded down. The assembly took about an hour with the tools provided. I am very satisfied. It was an excellent experience and I would go to Raymour and Flanigan again. The dining set is perfect for my living space, which is a studio apartment. Perfect size and looks so nice positioned by the widow with a view outside. Is the table top wood or laminate ? BEST ANSWER: The Nevada table is made of kiln-dried hardwood, bentwood and acacia wood. is this product available in your stores? BEST ANSWER: This item is available to order from our showrooms. Would it accommodate four chairs? Would the chairs slide under the dropped leaf? BEST ANSWER: Yes, this table would accommodate 4 chairs, but only with the leaves up. If they are in the dropped position the chairs will not slide under. how much does two extra chairs cost? BEST ANSWER: The Nevada Dining Chairs can be ordered individually and the SKU # is 798012274. Does this set come in counter height? BEST ANSWER: The Nevada Dining Set is not available in counter height. I purchased this table and chairs about three years ago. We recently moved to a new home and the top as became loose. I tightened the screws that are visible on the underside but the top remains loose. I believe there is a screw under the table top that fastens the top to the base. I'm not sure of how to get to what fastens the top to the base since the table was assembled when it was delivered. BEST ANSWER: Our Customer Care Team will be glad to assist you. Please contact them at 866-383-4484 option 2. Is this furniture totally assembled? the chairs and table? BEST ANSWER: Raymour & Flanigan provides a White Glove Delivery service. Delivery includes all necessary assembly and a comprehensive quality inspection of your furniture prior to it being delivered to your home. Some pieces may require final assembly in your home due to their size or configuration. If you select in store pick up, then some assembly will be needed. Is this fully assembled when delivered?? ?